Company’s coming for Sunday dinner, and you’re undecided what to make. Roast beef sounds like the perfect comfort food, smothered in vegetables and swimming in gravy, but there’s been a request for brisket, a dish you’ve never quite mastered. And what’s the difference between brisket and roast, anyway? A trip to the meat market and a discussion with your butcher may resolve your quandary. Shop at least a day ahead of time and prep early; both cuts need a long time in the oven. The expensive and impressive standing rib roast is sure to impress your guests, but you don’t need to break the bank to serve a respectable, tasty, tender beef roast. 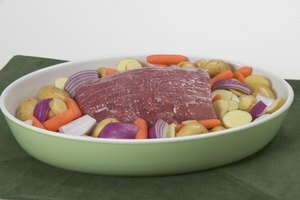 Basically, any roast cut from a steer or heifer is considered a beef roast. It’s up to you, the cook, to transform your roast – no matter where it originated ‒ into a silk purse. Looking at a carcass from the side, roasts are cut anywhere from the shoulder to the rump, top to bottom. Muscles, tendons and fat are distributed differently, depending on how much work that portion of meat has performed during the lifetime of the cow. The lazier the chunk of meat, the more tender it’ll be. The fatter it is, the more flavor you’ll taste. The carcass of a cow is divided into nine primal sections, from which sub-sections are identified and cut. Once the sub-section meat has been butchered and wrapped for individual sale, you have what is known as retail cuts. The front and rear of the animal produce the least tender meat because of all the muscles, tendons and connective tissue. 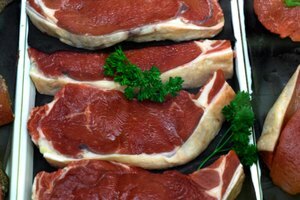 The middle section, where tenderloins, rib roasts, filets and sirloins come from, are the most tender. Chuck roasts are cut from the upper shoulder of the cow. Because they are critical to the animal’s movement, they have a lot of muscle and connective tissue. Searing and then slow, slow roasting breaks down the muscle and tissue and yields a tasty pot roast or stew. Moving away from the shoulder, the rib and short loin primal sections give us rib-eye and tenderloin, top sirloin and tri-tip roasts. Lean and tender, these roasts don’t need a long time in the oven. Overcooking toughens them. A rump roast comes from the outside of the back leg. 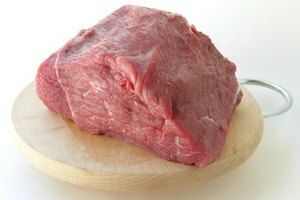 Its marbling gives it the flavor you want in a beef roast, and the price is on the low end of the spectrum. Brisket is a beef roast, but all beef roasts aren’t brisket. The breast of the animal, just above the leg, is where a brisket is cut. Because it supports the animal, the brisket is composed of more muscle than any other cut. Cooking a brisket so that it’s tender and mouthwatering is time-consuming, and you’ll get the best results when you prepare it over a two-day period. Salt the brisket and wrap it tightly. Place in the refrigerator overnight. The salt is a tenderizer, which this cut needs. Sear your brisket on both sides until the meat is brown and crispy. Fill your Dutch oven with beef broth and wine up to about half the side of the brisket. 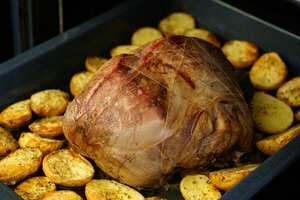 Roast for 3‒4 hours in the oven; then remove it and let it sit. Put the pot in the refrigerator or freezer to let the fat collect on top, and then scoop out the fat. Return the pot to the stove and heat. Trim off the fat side before slicing and serving.